Sprucing up your dog’s appearance is a fantastic way to bond with your pet. Dogs love it when you pull out the hairbrush and get start to smooth out their fur (less so if it’s accompanied by a bath), but one area of grooming that should never be ignored is a dog’s eyes. 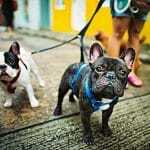 Many dogs are prone to tear stains appearing on their faces, which can be unsightly at best and sometimes problematic. Obviously, it’s a bigger concern for dogs with white (or otherwise very light) fur, but such unwelcome staining may impact any canine. This guide will explain what you can do about tear staining on your dog’s fur, and how you can prevent the problem from escalating. 1 Why Do Dogs Get Tear Stains? 1.1 How Can I Check if My Dog’s Tear Ducts are Working? 1.3 Could My Dog’s Tears Be a Result of Illness? 1.4 Which Dog Breeds Are Susceptible to Tear Stains? 1.5 How Can I Prevent Tear Stains in Dogs? 2 There’s Brown Stuff in My Dog’s Eyes – Do They Have an Eye Infection? 3.1 Is Cleaning a Dog’s Eyes with Salt Water Safe? 3.2 Are Eye Cleaning Products from the Pet Store Safe to Use? 3.3 Can I Remove My Dog’s Tear Stains with Hydrogen Peroxide? Why Do Dogs Get Tear Stains? The main reason for tear stains on a dog is epiphora, which as VCA Hospitals explains, is a result of blocked tear ducts. A dog generates tears as standard to lubricate their eyes, and these tears contain a substance called porphyrins – waste from your pet’s red blood cells. These tears will ordinarily be reabsorbed into your dog’s body. However, if the canine in question is living with epiphora, this will not happen – usually because the tear ducts are blocked, possibly by an ingrowing hair. This will lead to the water making its way onto your dog’s face with gleeful abandon. As a result of this, the fur below your dog’s eyes will eventually grow damp and start to stain with a dark red, rusty color – a result of those blood cell excesses. 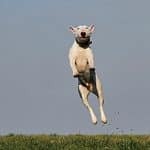 As we have said, this will be particularly noticeable on white dog breeds. 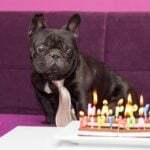 On paper, this is not necessarily anything to worry about beyond aesthetics and the mild inconvenience of damp fur (though this could lead to an unappealing aroma), but epiphora can lead to health complications – irritated skin that will leave your dog scratching and clawing. How Can I Check if My Dog’s Tear Ducts are Working? It will most likely require the help of a vet as you’ll need access to fluorescein eye stain. Your vet will hold this below your pet’s eye, and encourage Fido to tilt his head downward. From there, you’ll both wait for a tear to organically slide fall from your dog’s eye. There’s no need to upset him by telling weepy stories – dog tears are not inspired by sadness. If your dog does not have any issues, you will notice this year roll down their fur until it culminates at their nose. If this happens, you can relax. If the tear appears to stop halfway, however, then it suggests that they are struggling to cope with the production of tears – hence the staining. If this is the result, your vet will run many tests. Yes, a dog will not just leak tears from their eyes naturally – there could be many reasons why. As we have already mentioned, the good news is that, while dogs are hugely empathetic and emotional creatures, they do not tend to cry tears because they are upset. However, as TV dog expert Cesar Millan explains, there are many reasons why a dog’s tear ducts will leak. Infection. If your dog’s eyes are also swollen and seem to be excreting mucus, there is every chance that they have an infection. A vet should investigate this, as it may need medical treatment. Allergic Reactions. It’s no secret that dogs are prone to allergies. Your dog may find their eyes streaming due to exposure to plastic, dust, grass or anything else their body does not agree with. Foreign Object. 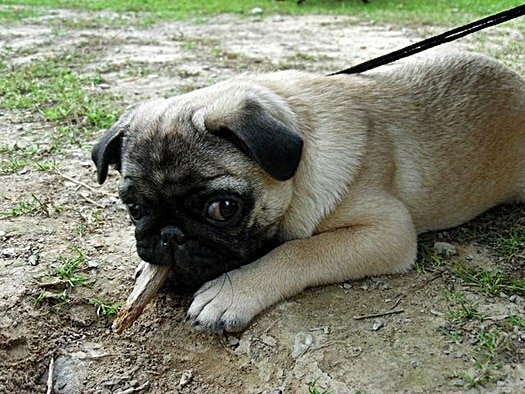 Some dogs are prone to poking their faces into areas that they do not belong, such as into bushes or shrubs. That means that it’s entirely possible they end up being poked in the eye by a twig, or have ended up with something stuck in their cornea. This should rectify itself before too long, but if your dog seems to be in discomfort for a prolonged period, you should speak to a vet. Scratched Cornea. In addition to potentially being poked by a sharp object, some dogs also like to play rough. Bring claws into the equation, and you have every chance that your dog has scratched their cornea, especially if they are pawing at the area a lot in addition to tearing up. Again, a vet will need to intervene if this is the case. Yeast Infection. If your dog has a yeast infection, it may result in watery eyes that stream regularly. This will be easily identifiable by the color of the staining; traditional tearstains will be a shade of rust as we have already stated, whereas dark brown stains denote an infection. A foul smell will also accompany the staining if an infection is to blame. The eyes are more than just the window to the soul – even though dogs do not necessarily see color like humans, their eyes remain very important and hugely delicate. This is why tears are organically generated as a form of maintenance. Sickness could also be to blame. 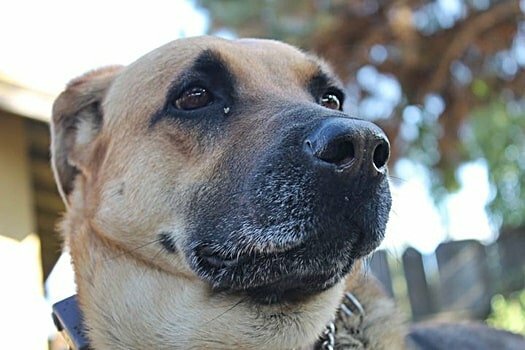 Could My Dog’s Tears Be a Result of Illness? Yes, many additional health concerns result on tearstains beyond the aforementioned epiphora – especially because that particular complaint is often a result of an underlying health concern. If you have any concerns at all about your dog’s eyes, get them to a vet for a once-over. You should be taking your pet for a nose-to-tail inspection at least once a year anyway, which will include taking a look at his or her eyes and ensuring that they are in good health, but you won’t want to take any chances. Which Dog Breeds Are Susceptible to Tear Stains? 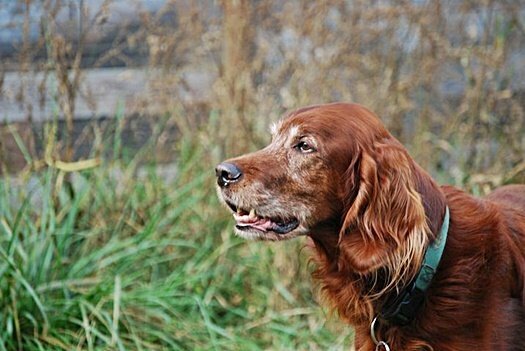 Yes, sometimes the genetics of particular dog breeds play a part in faulty tear ducts. Those most likely to struggle are flat-faced breeds and those that struggle with tear ducts. The good news is that, if you have one of these dogs in your family, their tear stain problem will almost certainly be purely aesthetic. How Can I Prevent Tear Stains in Dogs? This is a tricky one to answer, especially if your dog is one of the breeds that is genetically predisposed to this problem. However, there are many steps that you could take that may or may not be effective, depending on your particular pooch. Avoid Allergens. This is sound advice at all times, but especially if your dog’s eyes are streaming. If they seem to struggle after eating, ensure that it’s not a plastic bowl setting them off. If they come home from a walk with watery eyes, speak to a vet about antihistamines. If it’s a dust allergy, hire a cleaner to keep on top of the vacuuming in your home! You should also avoid anything else that might aggravate your dog’s eyes, such as smoking cigarettes and spraying aerosols. Do remember that some dogs hate vacuum cleaners. Provide Bottled Drinking Water. Some dogs find that their tear staining subsides if they drink bottled mineral water rather than tap water. This may get expensive and tricky to store if you have a large dog that guzzles a lot of fluid throughout a day, but it may be worth attempting. Ask Your Vet for a Saline Flush. If your dog has naturally narrow tear ducts (particularly likely in certain small and toy breeds), your vet will attempt to enlarge them using a process called a saline flush. This is unlikely to provide any permanent benefits, however, and your dog’s tear ducts will likely narrow again. Keep Your Dog’s Eyes Clear of Obstructions. Make sure you’re confident and have a steady hand if you’re going to trim the hair around your dog’s eyes with scissors, but this can be a helpful way of avoiding ocular irritation. You should also give the eyes a good wipe every now and again with soft tissue. Ensure Your Dog Has a Quality, Balanced Diet. Poor diet can be blamed for a great many ailments in a dog, and stained tear ducts are among them. 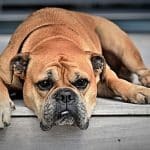 If you can make sure that your dog is getting all the necessary nutrients from their meals, they are far less likely to struggle with their tears. Constant Cleaning. It sounds obvious, but clean your dog’s eyes every day! Don’t wait for the tearstains to manifest – add a quick clean up to your daily grooming, regardless of whether you think your pooch needs it right now or not. None of these techniques will guarantee that your dog will never struggle with tearstains, especially if they are particularly prone to them, but you’re be giving yourself and Fido a fighting chance of doing so. Remember, though – if they do still develop tearstain they may be just fine and could be an aesthetic problem. There’s Brown Stuff in My Dog’s Eyes – Do They Have an Eye Infection? Brown gunk is usually just rheum, which we often refer to as ‘sleep’ in the eyes. 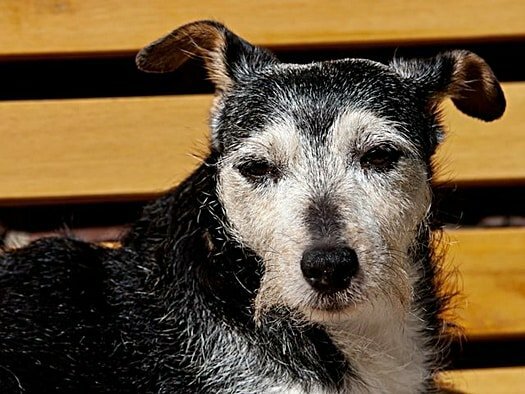 Made up of skin cells, oil, dust, mucus and all kinds of other debris that makes its way into the eye while your dog is contentedly snoozing, rheum is nothing to worry about as it happens to every dog. Just clean it up out each morning before it has an opportunity to harden. Other forms of discharge, however, are nothing to be trifled with. PetMD explains that yellow, green or gray leakage from a dog’s eye is something to worry about. Yellow or green crust or discharge is a classic sign of an eye infection, which in turn suggests that your dog is suffering from another ailment. Book an appointment with a vet as quickly as possible if you spot this on your pooch, as they will need a course of antibiotics to clear up the problem. Gray crust or discharge, meanwhile, suggests that Fido is living with keratoconjunctivitis or dry eyes. The condition is also known as KCS. This is especially likely if your dog’s eyes are red and bloodshot, as their body is attempting to make up for the fact that it cannot make sufficient tears to lubricate the eyes by creating mucus instead. This will irritate a dog’s eyes, and leave them in discomfort. Blindness is also a risk if KCS if left long enough, but most canines will respond to any medication that a vet prescribes. You have two options when it comes to cleaning up a dog’s eyes; specialist products, or good old-fashioned warm water. We’ll discuss the possibility of using the latter in a moment, but for now, let’s focus on natural remedies that won’t require a trip to the pet store. To clean a dog’s eyes, just run a bowl of warm (not hot) water and bring your dog into the room. The steam will help soften their fur and make the whole process a little easier. You should then dip a soft washcloth into the warm water and very gently rub at the eyes. This should also clean up any stains that may have been caused by the leaking tears. If you hold the cloth over the impacted area for a minute or two, it’s hugely likely to have a positive impact. Another step that you could take is to apply a little aloe vera gel to the area of the eyes that are leaking and causing tearstains. This is a natural anti-inflammatory, which means that these tearstains should not turn into a fungal infection. Of course, there’s another option here – take your dog to a professional groomer. However, if you do this every time your dog wakes up with a little brown gunk in their eye if could quickly become very expensive. Is Cleaning a Dog’s Eyes with Salt Water Safe? Yes, not only is it safe but it can be hugely impactful. Don’t use many than a single teaspoon, and be very, very careful not to get anything in your dog’s eyes. You could also pick up a saline solution from a vet or pet store if you prefer not to use table salt. Just be aware that, as always, this is not a permanent solution and will not resolve any medical conditions that may cause the tearstains. It’ll just deal with the aesthetic issue – though that’s half the battle if you have a white dog like a Bichon Frise. Are Eye Cleaning Products from the Pet Store Safe to Use? This is a matter of much debate, and the short answer is that it depends what is in them. We would like to trust a pet store to have the best interests of animals at heart and to never sell a product that could be in any way harmful to your dog. However, the FDA has needed to step in on more than one occasion due to certain major manufacturers including unsuitable ingredients. The more impactful of these is tylosin tartrate, an antibiotic treatment deemed suitable for cattle and other large animals but not domestic pets. This is just the tip of the iceberg, however. Remember that anything that seems too good to be true probably is, and if something claims to be a miracle cure, it will more than likely come with a laundry list of knock-on problems. There is also the question of whether specialist wipes are strictly necessary – many of them will not do a job that a home remedy can also help with. If you do decide to invest in an eye cleaning solution or wipe, you should be vigilant about researching the contents of the product. Have a chat with a member of staff that you consider to be trustworthy, and consider checking with your vet whether your dog has any allergies or sensitivities that need to be taken into consideration. Can I Remove My Dog’s Tear Stains with Hydrogen Peroxide? You can, if you consider yourself to be confident and competent in dealing with such a chemical. Mix a heavily diluted solution (roughly ten parts water for every one part hydrogen peroxide) and apply it to your dog’s tear stains using a cotton pad. This will eradicate the markings, and brighten and lighten your dog’s fur. Of course, this may mean that the area you have treated does not match the rest of your pet’s coat! You’ll also have to extremely careful not to get anything in Fido’s eyes, so this is not the treatment for fidgety pups! Overall, don’t lose sight of the fact that hydrogen peroxide is bleach, and it’s hugely dangerous to mess around with. If you’re not completely comfortable handling this solution, leave it well alone. Coconut Oil for Dog Tear Stains. Not only is coconut oil delicious and great for dog fur and skin, but applying it over tearstains also creates an invisible barrier. If you start applying coconut oil to your dog’s face, you may notice less staining – though they may also regularly attempt to lick their own eyes! Apple Cider Vinegar for Dog Tear Stains. This method is most likely to benefit a dog that suffers from tearstains through yeast or bacterial infection, as dropping a teaspoon a day into your dog’s water will increase the levels of acid in their body. Yogurt for Dog Tear Stains. Again, if your dog struggles with infection, then yogurt will help. If you allow your dog a teaspoon of yogurt each day, they will load up their gut with good bacteria, and theoretically, prevent tearstains from taking hold of their adorable faces. Essential Oils for Dog Tear Stains. There are a handful of essential oils that, when diluted with water and applied using a cotton pad, can have a great impact on dog tear stains. The most notable examples of these are Chamomile, Euphrasia (also, helpfully, known as Eyebright) and Calendula are the most impactful oils that you’ll be able to pick up. As always, consult a vet before you use any new products on your dog’s fur or skin just in case they are likely to suffer an allergic reaction. Tearstains in and of themselves are not necessarily dangerous – bringing something unwelcome into contact with your could be! Dog tearstains can be a tricky thing, and they have to be managed carefully. It’s completely understandable that you want your adorable pup to be even cuter and not suffer from unsightly marks below their eyes, but don’t put them at any risk unnecessarily. 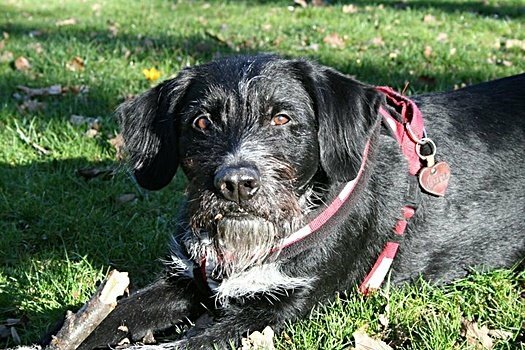 Overall, this is largely an aesthetic concern rather than a health-related matter – but don’t hesitate to consult a professional if you are worried that your dog could be at risk.